Our pullers and tensioners are all equiped hydraulic systems and diesel engine systems. The small set can be used for OPGW or ADSS stringing operation, and also pilot wire rope stringing operation. The big set can be used for overhead transmission line up to 1000 KV. Application: The hydraulic puller is used to pull pilot steel wire rope for conductors in overhead transmission line construction. 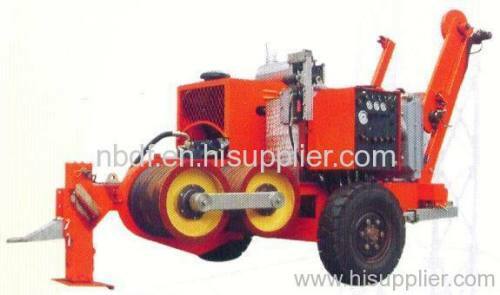 It is fully hydraulic controlled, easily used and maintained. -Closed hydraulic circuit,infinitely variable speed control in both rotating directions. -The max pulling force for stringing operation can be preset, pulling force in the rope can be read on the line pull gauge. -Hydraulic actuated pulling rope clamp for convenient reel change. 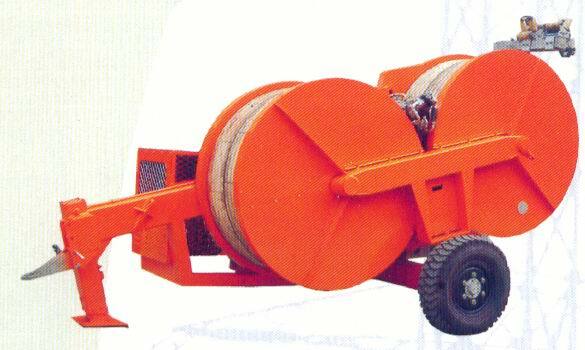 -Integral hydraulic self-loading reel winder with automatic level wind. -Engine: Cummins (China) water-cooled diesel engine. 3. 25 years of production experience and more than 1000 customers in the country and abroad market. The set of 4 ton puller and 3 ton tensioner have been sold to more than 20 countries. The set of 9 ton puller with 8 ton tensioner have been sold to more than 10 countries.